Study: Climate change helped spark Syrian civil war. 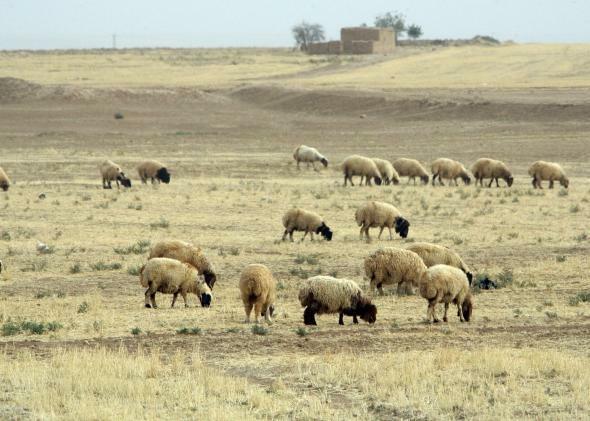 Sheep graze in drought-affected fields in Hasaka, Syria, on June 18, 2010. Titley says that the connection between climate change and the Syrian conflict means it could be “a harbinger of where we may end up more in the future.” He has helped shape the U.S. military position on climate change to a more proactive one, casting climate change as a “threat multiplier” for national security. My interview with him last year remains one of the most fascinating and terrifying conversations I’ve ever had. The drought from 2006-2010 was the worst ever recorded in northeast Syria, driving thousands of farmers away from their homes and towards crowded cities. A new study links it to climate change and says it may have helped spark the civil war. The consistency of climate models made the eastern Mediterranean a great place to start looking for possible connections between human-cause climate change and conflict. The Middle East has already seen decades of drying, which is expected to intensify for the next 20 years and beyond as a result of climate change. 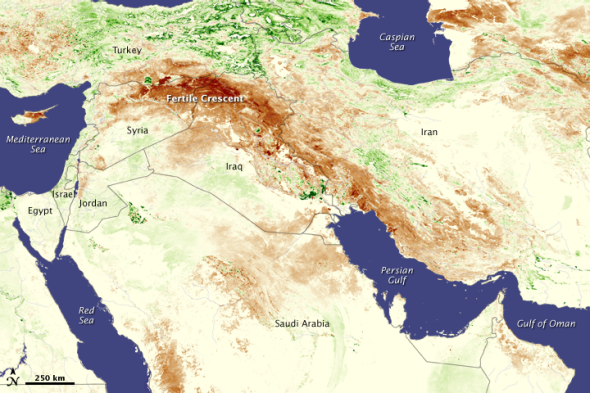 Colin Kelley, a climate scientist at the University of California–Santa Barbara and the study’s lead author, said long-term climate trends made Syria’s 2006-2010 drought two to three times more likely, and future trends point in the same direction. Of course, since 2011, the Syrian conflict has ballooned into a multinational war, with nearly 4 million refugees across the region. Are they the world’s first climate change refugees due to conflict? Severe drought resumed in late 2013, and ISIS has used the resulting water shortfall to its advantage. King says at one point last year, ISIS controlled all three major dams in Iraq, a feat that he says quickly motivated an enhanced U.S. military presence there. Beyond the case of Syria, the new study provides a powerful tool for researchers interested in how human-induced climate change may be affecting conflict worldwide. King points specifically to Libya, Egypt, and Yemen as next potential fronts in climate change-fueled conflict. In general, climate change poses an increasing challenge for fragile states to provide stable services. While violent conflict over water is far from likely in the United States, Kelley says “we need to be proactive.” Kelley says one of the biggest lessons that California can learn from Syria is: “Let’s not just assume that things will be fine.” Recent research showed that climate change will increase the risk of multidecadal “megadrought” in the West dramatically. Until recently, climate and security experts have focused their research mostly on the humanitarian and disaster-relief implications of increasing extreme weather. “The Syrian conflict is one of the first instances of the dark side, the evil face of climate and security, not the last,” Titley said.